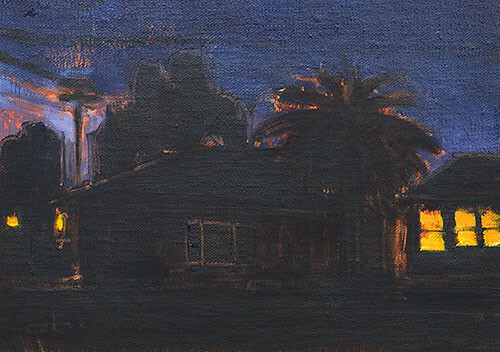 This entry was posted in Landscape Paintings, San Diego Paintings, Urban Landscapes and tagged 5 x 7 inches, architecture, landscape, night, nocturne, north park, oil on linen on panel, palm tree, san diego, south park on May 22, 2015 by Kevin. Trash Day in South Park, San Diego. Painted last year. 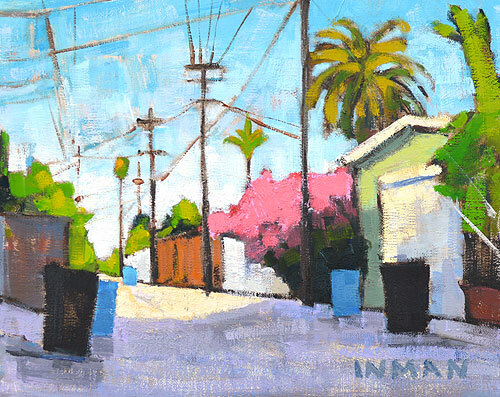 This entry was posted in Landscape Paintings, San Diego Paintings, Urban Landscapes and tagged 8 x 10 inches, alley, california, oil on linen on panel, san diego, south park, trash cans on March 3, 2015 by Kevin. The canyon by my friend Lenise’s house, in South Park. The South Bay sparkling in the distance. 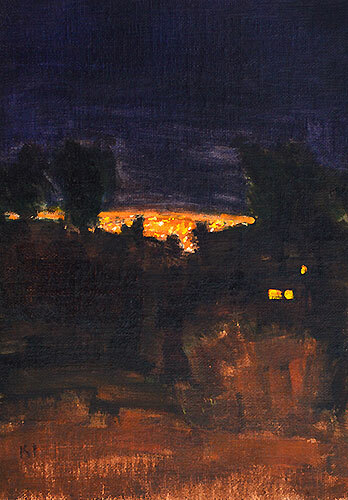 This entry was posted in Landscape Paintings, San Diego Paintings, Urban Landscapes and tagged 7 x 5 inches, california, canyon, city lights, night painting, nocturne, oil on linen on panel, san diego, south park on December 10, 2014 by Kevin. 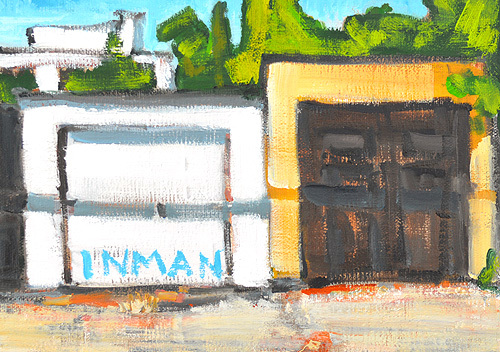 This entry was posted in Landscape Paintings, San Diego Paintings, Urban Landscapes and tagged 5 x 7 inches, alley, burlingame, california, garage, north park, oil on linen on panel, san diego, south park on December 22, 2013 by Kevin. This painting happened sort of by accident but it is also staged. Let me explain. 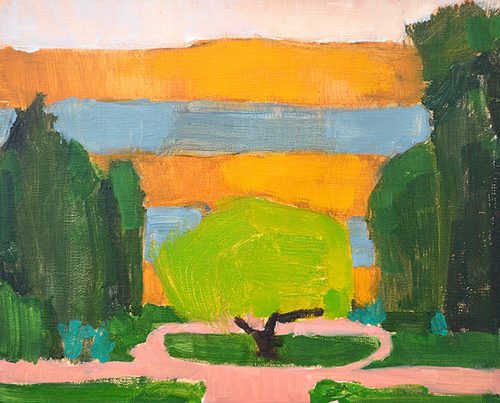 I was painting in Balboa Park, a painting of some trees. And I drove home a different way than usual , through South Park. I saw this orange house and thought, what a great orange house. Then I saw the orange Prius parked in front of the orange house and I thought, Ha! So then I parked MY orange Prius up the hill behind and painted this. 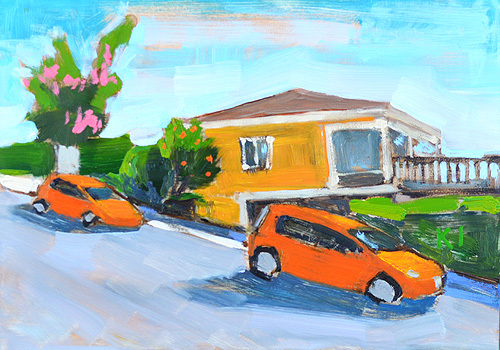 This entry was posted in Landscape Paintings, San Diego Paintings, Urban Landscapes and tagged 5 x 7 inches, california, car, landscape, oil on linen on panel, orange, painting, prius, san diego, south park on December 11, 2013 by Kevin. 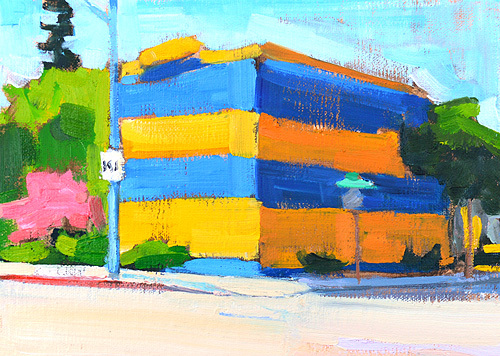 This entry was posted in Landscape Paintings, San Diego Paintings, Urban Landscapes and tagged 30th Street, 5 x 7 inches, blue, california, city, house, north park, oil on linen on panel, san diego, south park, termite tent, urban, yellow on December 5, 2013 by Kevin. A hot afternoon while my clothes did their thing in the laundromat. In South Park, San Diego. 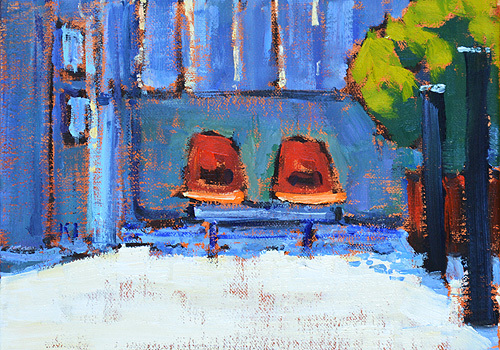 This entry was posted in Landscape Paintings, San Diego Paintings, Urban Landscapes and tagged 5 x 7 inches, california, laundromat, oil on linen on panel, san diego, south park, tulip chairs on September 6, 2013 by Kevin. Saturday afternoon found me at a laundromat. I like clean clothes. I did not exactly plan this series that’s developed of paintings outside laundromats, but it has happened, and I like it. This particular laundromat is in Golden Hill. Although Golden Hill is a chichi area with extremely expensive Victorian homes, the laundromat turned out to be a dank hole. It does, however, possess the critical amenity of ample parking and it has this tamale shop stuck under an awning right beside it. 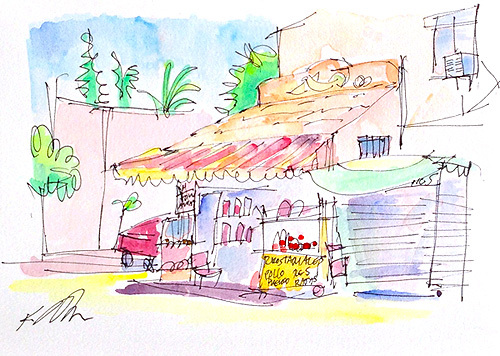 I loved the tamale shop and the awning immediately and I had to paint it. This entry was posted in Landscape Paintings, San Diego Paintings, Urban Landscapes and tagged 5 x 7 inches, california, city, golden hill, landscape, san diego, south park, tamale shop, urban, watercolor on August 25, 2013 by Kevin. At the laundromat again, drawing out front while my clothes were in the wash. 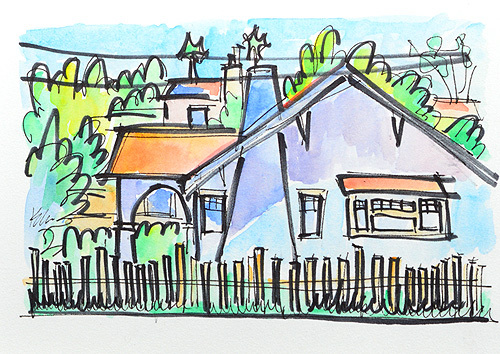 This entry was posted in Landscape Paintings, San Diego Paintings, Urban Landscapes and tagged 5 x 7 inches, craftsman, house, landscape, laundromat, north park, san diego, south park, urban, watercolor on August 18, 2013 by Kevin. Painted at the Starbucks in Golden Hill yesterday morning, looking over the Farmer’s Market. 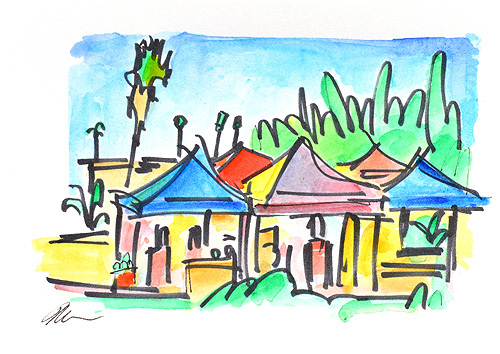 This entry was posted in Landscape Paintings, San Diego Paintings, Urban Landscapes and tagged 5 x 7 inches, farmers market, golden hill, san diego, south park, tent, watercolor on August 11, 2013 by Kevin. 3 year old boy: What’s that? Father: It’s a flag. Can you say flag? 3 year old: Flag. I’m gonna f*** her like a pig!!! – I just kept painting. 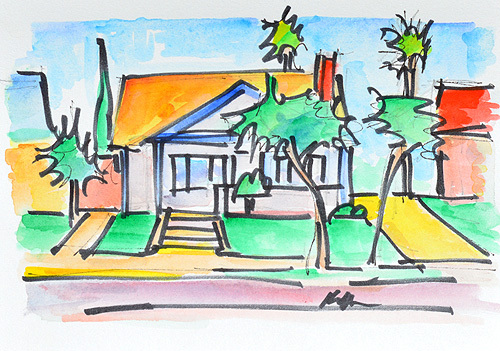 This entry was posted in Landscape Paintings, San Diego Paintings, Urban Landscapes and tagged 5 x 7 inches, architecture, craftsman, home, house, landscape, san diego, south park, southpark, urban, watercolor on August 3, 2013 by Kevin.